Arab terrorist threw knife at security forces near Ma'ale Shomron, while another armed with knife arrested at Cave of Patriarchs. A female Arab terrorist attempted a stabbing attack Sunday morning at "Curve 90," on the road that ascends to Ma'ale Shomron in Samaria. According to reports, the terrorist ran toward a military security coordinator driving in her direction. She threw a knife at his vehicle and then tried to flee to the nearby village Azzun. Security forces managed to capture the terrorist and arrest her. No one was injured in the incident. 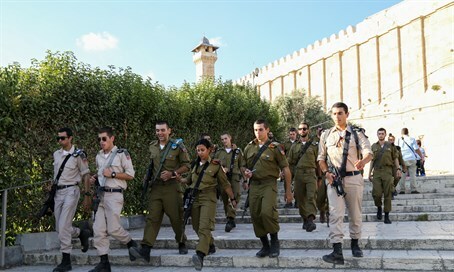 The thwarted attack came several minutes before a female Arab armed with a knife was arrested by security forces during an inspection at the entrance to the Cave of the Patriarchs in Hevron. The terrorist was detained for questioning. Earlier on Sunday, a 21-year-old IDF soldier stabbed at the corner of HaTzvi and Yirmiyahu Streets in Jerusalem. He was evacuated in light condition to Hadassah Medical Center; the terrorist was taken into custody.